One of the more widely grown native plants are the Crowea species. Spring flowering, masses of flowers, attractive to bees and butterflies ad easy care. A lot to like about this group of plants with C. angustifolia and C. exalta both being species that are widely grown and readily available for sale. A group of small shrubs, Crowea are an attractive group of flowering plants related to Boronia and require similar growing conditions. They work well in a mixed planting in the native border and are also suited to growing in a rock garden. Starry flowers range from white through to red (white are difficult to find in nurseries). The great attraction of Crowea is that they tend to flower over an extended period. From Summer through to Autumn, they put on a good show of flowers. The lightly scented flowers and attractive foliage make them a good garden plant. Evergreen and easy care, they are a little variable in height and growth habit. Very attractive and we do use them encourage to bees and butterflies and useful in the garden border. A few very low growing cultivars with a mounding habit are now available, these work well as ground cover plants for sunny positions. A humus rich moist, but well drained partly shaded to sunny position with protection from wind. Mound up soil to improve drainage if needed. Uses a low phosphate native plant fertiliser in spring. Stake young plants and use a plant protection barrier to help the plant through its first year. Some extra water through the first summer may be needed. Prune lightly after flowering to maintain a bush compact habit. C. angustifolia – To 3m in height with white to pink flowers. 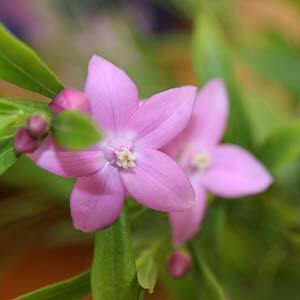 C. exalata – Commonly called the small Crowea, attractive pink flowers. Or maybe one of the hybrid forms such as Crowea ‘Poorinda Ecstasy’ with its pale pink flowers or look for the cultivar ‘Festival’ with darker pink starry flowers.